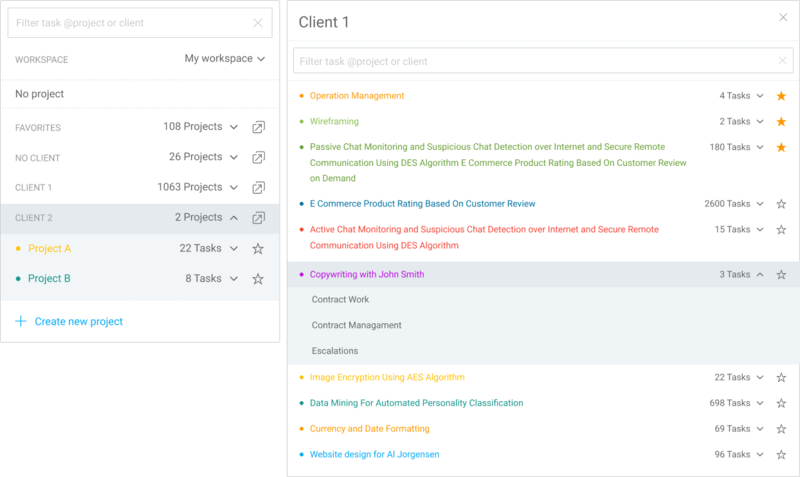 If you have hundreds of clients, projects, and tasks, and have trouble finding the right one when tracking time, you might want to enable compact project list in your Personal Settings. Compact project list collapses all projects under its client, making the list more manageable. If your projects/clients have long name, you can expand the list across the whole screen. If there are some projects you’re using often, you can mark them as favorite so they appear at the top of the project finder. You can mark a project as a favorite in the Projects page by clicking on the star next to it, or directly in the project finder. Favorite projects are user specific. When you mark some project as a favorite, this doesn’t affect other users. Each user can have his or her own set of favorite projects. If you use a lot of tasks when tracking time, you might want to switch to “Filter primarily by: Task” in workspace settings.